The importance of the mining sector has once again been underscored by the government during a recent meeting with Gold and Diamond Miners Association (GGDMA) and President Donald Ramotar along with and Minister of Natural Resources and the Environment, Robert Persaud and Minister of Finance, Dr. Ashni Singh. iNews was told that the GGDMA over the past 31 years has supported the mining industry from under 10,000 ounces of gold to a record of 438,645 ounces in 2012. In 2011, the mining sector came under the purview of the Ministry of Natural Resources and the Environment, which saw gold declaration and production continually increased. As such, this year declaration target is set to surpass past 460,000 ounces, which will be setting the record for the highest gold declaration, surpassing OMAI and local combined declaration in 2001 of 456, 000 ounces. The declaration to date is 300,000 ounces. According to the top GGDMA Member, the Association is working closely with the Ministry of Natural Resources and the Environment and its agency- the Guyana Geology and Mines Commission with a renewed commitment to mining with environmentally friendly systems. Areas currently being discussed include the reduction in the use of mercury, improvement in the recovery rate of the Sluice box, alternative Recovery Systems, reclamation and Rehabilitation Systems. In light of the falling gold prices and the cost associated with the industry, the GGDMA made a pitch to President Ramotar and his government to examine a request for an excise tax of five percent (5%) on imported fuel from legitimate oil companies in the Caribbean Region, since fuel is 25% – 30% cost of production to miners. The Association also made a request to waiver of taxes on the importation of 4×4, 4 door open back vehicles. These vehicles are still being deemed as luxury items/vehicles and attract heavy import duties. However, GGDMA stated that these vehicles are necessary and will also provide an additional form of security to miners. Further, the GGDMA Member explained that a request was also made for miners to be allowed up to 50% of the value of gold sold to GGB in foreign exchange. GGDMA is urgently requesting that foreign exchange be made available to assist the small and medium scale miners, during this crisis of falling gold prices, for them to import much needed spares and machinery, since some companies are taking advantage of the miners. There is ongoing discussion on this matter between the GGDMA and the Ministry of Natural Resources and the Environment and the Ministry of Finance. 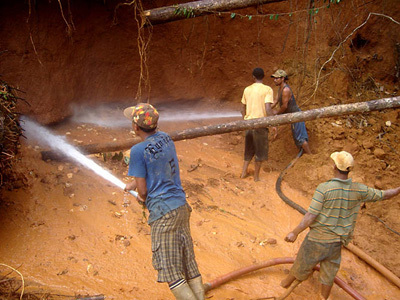 In the area of security, the Association is concerned about the increase in crime and other illegal activities there are infiltrating the mining communities. GGDMA has also raised concerns about the time delay in getting approval for firearms licences, permits/approval for miners to establish their own security service, work permits for non-Guyanese. Meanwhile, the GGDMA called on the Guyana Geology and Mines Commission to manage and give direction to the mining industry, especially the Gold and Diamond Sector, in this critical time of falling gold prices, to tackle illegal mining, collusion of GGMC Officers and Miners and other criminal activities in the hinterlands of Guyana.